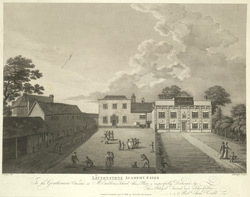 View of the buildings and grounds of Leytonstone Academy in Essex in c.1800. Leytonstone was part of the parish of Leyton and Leyton by the stone existed as a separate hamlet by the 14th century. Leyton High Road, which was an important coaching route out of London to Epping Forest, ran through this settlement. The print shows a private school for educating gentlemen run by a Mr Emblin. In the garden, the pupils are playing with hoops, kites, dogs and balls.